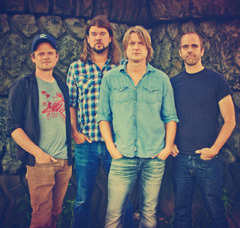 Americana/alt-country band Yarn’s sound owes as much to Gram Parsons and Earl Scruggs as to Jerry Garcia and Exile On Main Street-era Rolling Stones. Much like its name, the band Yarn weaves country, rock, blues and more into a genre-defying blend that has captured the attention of fans and critics alike. Following in a fine tradition that includes forward thinking roots bands like The Flying Burrito Brothers and New Riders of The Purple Sage. Yarn weaves roots music idioms into a fresh sound that turns on hipsters and fans of country music alike, with technically impressive song-crafting and universal tales from the road of life.